According to the United States Census Bureau, the city has a total area of 17.1 square kilometers (6.6 sq mi). 17.0 square kilometers (6.6 sq mi) of it is land and 0.14% is water. Its Geographical coordinates are 33°49′6″N 118°2′21″W﻿ / ﻿33.81833°N 118.03917°W﻿ / 33.81833; -118.03917. As of the census of 2000, there were 46,229 people, 15,654 households, and 12,241 families residing in the city. The population density was 6,991.1 inhabitants per square mile (2,700.3/km²). There were 16,028 housing units at an average density of 2,423.9 per square mile (936.2/km²). The racial makeup of the city was 65.61% White, 20.81% Asian, 0.40% Pacific Islander, 2.77% Black or African American, 0.59% Native American, 5.44% from other races, and 4.38% from two or more races. 15.65% of the population were Hispanic or Latino. There were 15,654 households out of which 38.8% had children under the age of 18 living with them, 60.0% were married couples living together, 13.3% had a female householder with no husband present, and 21.8% were non-families. 17.6% of all households were made up of individuals and 6.6% had someone living alone who was 65 years of age or older. The average household size was 2.93 and the average family size was 3.31. In the city, the population was spread out with 27.0% under the age of 18, 7.9% from 18 to 24, 30.2% from 25 to 44, 24.4% from 45 to 64, and 10.6% who were 65 years of age or older. The median age was 37 years. For every 100 females, there were 94.9 males. For every 100 females age 18 and over, there were 90.5 males. The median income for a household in the city was $64,377, and the median income for a family was $70,060 (these figures had risen to $80,331 and $86,286 respectively as of a 2007 estimate). Males had a median income of $50,781 versus $36,337 for females. The per capita income for the city was $25,798. About 4.6% of families and 6.0% of the population were below the poverty line, including 7.2% of those under age 18 and 5.1% of those age 65 or over. The 2008 population estimated by the California Department of Finance was 49,541. The population was spread out with 11,343 people (23.7%) under the age of 18, 4,700 people (9.8%) aged 18 to 24, 11,685 people (24.4%) aged 25 to 44, 13,913 people (29.1%) aged 45 to 64, and 6,161 people (12.9%) who were 65 years of age or older. The median age was 39.9 years. For every 100 females, there were 94.2 males. For every 100 females age 18 and over, there were 90.3 males. Real Mex Restaurants, Vans, and Mitsubishi Motors North America are headquartered in Cypress. The Los Alamitos Race Course is located in Cypress, even though it bears the name of its neighboring city of Los Alamitos. In the California State Legislature, Cypress is in the 29th Senate District, represented by Republican Ling Ling Chang, and in the 65th Assembly District, represented by Democrat Sharon Quirk-Silva. In the United States House of Representatives, Cypress is in California's 47th congressional district, represented by Democrat Alan Lowenthal. The United States Postal Service Cypress Post Office is located at 5762 Lincoln Avenue. According to the California Secretary of State, as of October 22, 2018, Cypress has 25,996 registered voters. Of those, 8,939 (34.39%) are registered Republicans, 8,767 (33.72%) are registered Democrats, and 7,274 (27.98%) have declined to state a political party/are independents. The city is a part of the Anaheim Union High School District and the Cypress Elementary School District. Cypress College is located in the city. Notable natives and residents include actors John Stamos, Brian Tochi, and Matthew Morrison, golfer Tiger Woods, drummer Adrian Young (No Doubt), boxer Jerry Quarry, major league baseball player Troy O'Leary, and Comedy Bang! Bang! host Scott Aukerman. ^ "Department of Administration". City of Cypress. Retrieved April 23, 2017. ^ "City Council of the City of Cypress". City of Cypress. Retrieved April 23, 2017. ^ "Cypress". Geographic Names Information System. United States Geological Survey. Retrieved January 18, 2015. ^ "Cypress (city) QuickFacts". United States Census Bureau. Retrieved March 9, 2015. 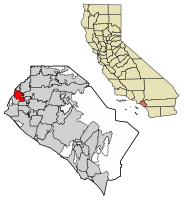 ^ "2010 Census Interactive Population Search: CA - Cypress city". U.S. Census Bureau. Retrieved July 12, 2014. ^ "Comprehensive Annual Financial Report for the Fiscal Year Ended June 30, 2018". City of Cypress. Retrieved February 7, 2019. ^ "California's 47th Congressional District - Representatives & District Map". Civic Impulse, LLC. ^ "Post Office Location - CYPRESS." United States Postal Service. Retrieved on December 6, 2008. ^ "SOV.xls" (PDF). Retrieved April 14, 2019. ^ "Statement of vote : California. Secretary of State". Archive.org. Retrieved April 14, 2019. ^ "Official Web Site". Retrieved July 21, 2017. ^ a b c d e f g h i "Cypress School District". www.cypsd.k12.ca.us. Retrieved July 21, 2017. ^ Dirmann, Tina (December 2009). "Matthew Morrison Revealed". Orange Coast: 89. ISSN 0279-0483. ^ "About Tiger Woods". Tiger Woods web site.